Located in Hawaii Volcanoes National Park, Thurston Lava Tube is one of the main attractions for visitors as they explore the park . Like veins leading from the central 'heart' of the volcano, lava tubes direct molten earth toward the ocean. As the lava flows the outer crust begins to harden while the inner lava continues to flow. Once the flow stops, the tunnel formation remains. Thurston Lava Tube could date back some 350-500 years. The tube is named for Lorrin Thurston, a newspaper publisher that played an instrumental role in creating the park. Due to the constant volcanic activity, you'll find white sands, green sands and black sands on Hawaii Island. Located on the southeastern Kau coast, Punaluu Black Sand Beach is one of the most famous black sand beaches in Hawaii. Although the shoreline can be a bit rocky and places, the water was pleasantly warm and it was wonderful to float and relax just beyond the breaking waves. Located between Hawaii Volcanoes National Park and the small town of Naalehu, Punaluu Black Sand Beach's jet black shores are an unforgettable sight. Coconut palms fringe the upper edge of sand and you may also discover turtles, basking on the beach. Although it may be tempting, do not touch these protected turtles and do not remove any black sand from the beach. The area is a well-known nesting place for hawksbill and green sea turtles, both endangered species and the target of many conservation efforts. Adventuring with my sweet Hawaiian beauty to Makalawena Beach. It's said that this might be the best beach on the Big Island that can't be reached by road. There are several bays scooped out of the Kona Coast with gorgeous white sand and plentiful shade from palm trees. The hike out to Makalawena keeps the crowds away, especially on weekdays. This "off the beaten path" beach is so perfect that you may never want to leave! Honokohau is one of the many beaches that form the Kalolo-Honokohau National Historic Park. This 1160-acre park boasts some of the best archaeological sites and artifacts in the state, including ancient petroglyphs (rock carvings), temples, burial sites, trails, house platforms and three fishponds – Aiopio, Aimakapa and Kaloko – all of which is evidence that this area once supported a Hawaiian settlement of several hundred people. Honokohau Beach, located on the Big Island’s west shore, is a long salt-and-pepper sand beach, with fragments of ground-up seashells, coral and lava rock. There’s a low lava shelf at the water’s edge that lines most of the shore. The nearshore ocean bottom is shallow and rocky, and an offshore fringing reef shelters the beach from strong surf and currents. This is a good place for snorkeling. Numerous sea turtles frequent the beach to feed on the limu (algae) and bask along the shore. Taking in the views from Lion Peak, just off the PCT along the Desert Divide. Named by the USFS in 1960 after our native California Mountain Lion. Lion Peak avails its summit as an easy access off the Pacific Crest Trail. Being near the southern most end of the San Jacinto range at an elevation of 6868 feet, this peak affords clear views of Pinyon Flat and the Santa Rosa Mountain range more than San Jacinto. Neighboring Pine Mountain and Devil’s Rockpile are in constant view and provide a significant landmark. The Pacific Crest Trail winds and wiggles northward through the San Jacinto Mountain Range; making its way from the oaken forests, chaparral, yucca, and cacti desert highland and eventually sub-alpine forests of pine and fir. This southern section of the San Jacinto Mountain Range is known as the Desert Divide, and on its eastern flank, you'll find several deep, eroded, boulder-strewn desert canyons. Rock composition mainly of batholithic rock and granite. The perennial "Grand Old Man of the Mountains" of the Hundred Peaks Section, Sam Fink single-handedly constructed a trail along the crest of the Desert Divide in the southern San Jacinto Mountains that became known as the "Sam Fink Trail." The views along this section of the PCT are breathtaking; the entire Santa Rosa range to the south, the San Jacinto Wilderness to the north, the Coachella Valley to the east, and Garner Valley, Thomas Mountain along with Lake Hemet to the west all seen quite clearly year-round. Many of the Hundred Peaks Section peaks in the 7000’ range are found here and easily accessed off the PCT. Getting up early for outdoor activities is so much easier than getting up early for work. But I still need my coffee. Enjoyed a 5am rise for a Mission Trails trek along Deerfield Trail/Oak Grove/Rock Climber's Loop/Visitor Center Trail with family and friends. My sister took a pretty hard hit to her knee when she fell but she held back the tears and kept on truckin'. What a trooper! Shared the trail with plenty of hawks and bunnies. Another outing featured in Jerry Schad's 50 Best Short Hikes in San Diego. We enjoyed a 5 mile group walk around the upper extremity of west Mission Bay, Sail Bay- sharing the path with bicyclist and other pedestrians and enjoying fine views of the blue waters and colorful neighborhoods surrounding them. At an elevation of 4,647 feet, Mount Tule is the highest point along the In-Ko-Pah Mountain range. 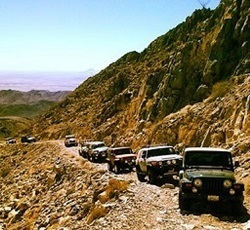 The summit affords fantastic views of McCain Valley, Anza Borrego, Carrizo Gorge and the old San Diego & Eastern Arizona railroad tracks, and even on out to the San Jacinto Mountains. Strong winds kept our visit to the summit a brief one. On the way down we came upon a gopher snake, warming itself on the road. Third snake sighting this year. Exploring a portion of the Jacumba Wilderness in westernmost Imperial County. This rugged and picturesque high-desert area, administered by the federal Bureau of Land Management, gets relatively few footprints from recreational hikers and possibly more of them from migrants heading north from Mexico. Due to formidable fencing recently installed along much of the international border, there’s not as much immigrant traffic as there used to be. Nevertheless, for safety, it’s advisable to travel in groups out there. I got out early to beat the storm and hiked against the PCT thru-hiker traffic, south to the falls. The more popular route heads north from near the Boulder Oaks campground and under Interstate 8. The vast majority of freeway travellers pass near these falls without ever knowing it. It's truly a hidden gem. The upper part of the creek near the trail head offers some inviting swimming holes. I'll have to come back with the family on one of these warm, late spring afternoons. I can remember the first time I hiked out to these falls about seven years ago. At the time I didn't hike a lot and this trek took a lot out of me. This time around, I did much better. Three Sisters Waterfalls, south of Julian, is one of the more popular Southern California falls. It is best to visit after a good season of rain. While the area is a spectacular spot to explore, the trail into the canyon it is extremely steep with little to no shade. Unfortunately, this often does little to deter unprepared visitors. When I can't get out to the back country, I'll settle for a little urban hiking. Although the museums, historic buildings, gardens, and San Diego zoo at Balboa Park get most of the attention, there are plenty of hidden spaces and trails to explore within the park's 1200 acres. Truly a gem of the Laguna Mountains and the Cleveland National Forest, the Sunset Trail takes hikers through dense forest, vast meadows, grazing cattle, gorgeous viewpoints and during a wet year, a pond and several large lakes. On a clear day, this trail offers impressive panoramic views of surrounding mountain ranges, the Pacific Ocean and downtown San Diego. Native Americans summered here to avoid the heat of the desert and lowlands. Bedrock morteros can be found along the trail. Livestock ranching and mining came here in the 1800's. Recreation began to play an important role in the area by the early 1900's. Today, these mountains serve as a retreat for many outdoor enthusiasts of San Diego County.